How to Buy Factory-Unlocked Contract-Free iPhone X in the United States? The Apple iPhone X is hitting stores around the world in November. Despite the fact that this is the most expensive iPhone ever, many consumers are ready to pay the full price from $999 to $1,149 for it. However, remember that there are some different models of the iPhone X and some won’t be fully compatible with your carrier. So, you should check all the info carefully before placing the order. The safest option is to buy a factory-unlocked iPhone X so that you can switch carriers easily and use overseas without any limitation. The most comprehensive iPhone X model is A1865 and we’re going to show you how to buy it. Besides, the A1865 model is available via Sprint and Verizon; Previously, you couldn’t buy it without an active contract/account with the carriers. You would have to provide info like wireless number, billing zip code, and SSN even when you agree to pay full price. If you have a contract, all of the iPhones are unlocked, including the ones from Apple iPhone upgrade program and Apple iPhone installments. The good news is that Apple no longer requires carrier activation before making the purchase. We now have an option to skip carrier activation. After receiving the iPhone X, you can insert an active SIM card and use it as an unlocked phone. Don’t buy the AT&T or T-Mobile versions because they don’t have CDMA networks, so it won’t have good coverage when you switch to Sprint or Verizon. Having said that, the model is perfect if you just use it with GSM carriers. Remember that you should buy directly from Apple only. All iPhone X purchased from Bestbuy, T-Mobile, AT&T, Sprint, or Verizon will come locked for at least a few months. For instance, you will have to wait 40 days to unlock T-Mobile phones, 50 days for Sprint, and 60 days for AT&T. Verizon phones used to be unlocked even when you didn’t use their service. However, that’s no longer the case as they started locking phones since early 2018. The decision was made to combat phone theft; Verizon phones were attractive as they can be resold on the black market and used with different carriers. Apart from the online store, you actually can buy unlocked iPhone X at a physical Apple Store. You can just walk into a store and ask to pay full price for an unlocked iPhone. They will bring you a sealed iPhone without the need of verifying an active account on one of those carriers. So, how do you manage to buy an unlocked contract-free iPhone X? Share with us in a comment below. Actually, 2 are GSM and 2 are CDMA. All of the carriers will support GSM. However, not all of them will support CDMA. Since, you will be using GSM, you have the option for buying all of the carriers. But AT&T and t-mobile will show vest coverage for GSM. Is there iphone X with dual sim card feature – to support both GSM and CDMA? buy the model#A1865 will be best to use in all countries. This is not very clear. It happens that I’ll be in Florida from the 30th of October till the 11th of November, I was planning to purchase an unlocked SIM-free iPhone X, but after reading this article I have less than zero idea how to do that. I realize that most likely the unlocked SIM-free won’t be available to purchase in the time that I’m there and I honestly can’t understand how I can place an order for a contract one… and the contract? Can I cancel it? Will the iPhone work abroad? iPhone works abroad and will be unlocked forever unless you purchase the phone with US carrier payment plans. if you pay full price then no problem at all. You must have an active account with a carrier (except T Mobile) regardless of payment option. There are private suppliers who have factory unlocked, sim-free iPhone x on offer. Leave message for me, if you would like one. I have a T Mobile account, but may want to go back to Verizon in the future. I am very interested in the sim free iPhone X, Space Gray, and 256G. I am willing to pay full price without any installment payment or upgrade program. Hi. I want a sim free iPhone X 256gb Silver piece. Can you just ping me a message..
Can you tell me a place in zip code 85719 where i can buy iphone X unlock version . Another question would it carry international warranty. I’m looking for an iPhone x256 gb with no contract. Where can I get one? I NEED FULLY UNLOCKED FREE SIM IPHONE X FOR 256GB ( GRAY COLOR) TO USE IT BOTH IN USA AND OUTSIDE. LET ME KNOW PLEASE ANY VARIANTS AND PRICES. I need an unlocked iPhone X 256GB that I can use with my MetroPCS service. The article does not fulfill its stated purpose, in that it does not answer the question of how to purchase the iPhone X contract free. 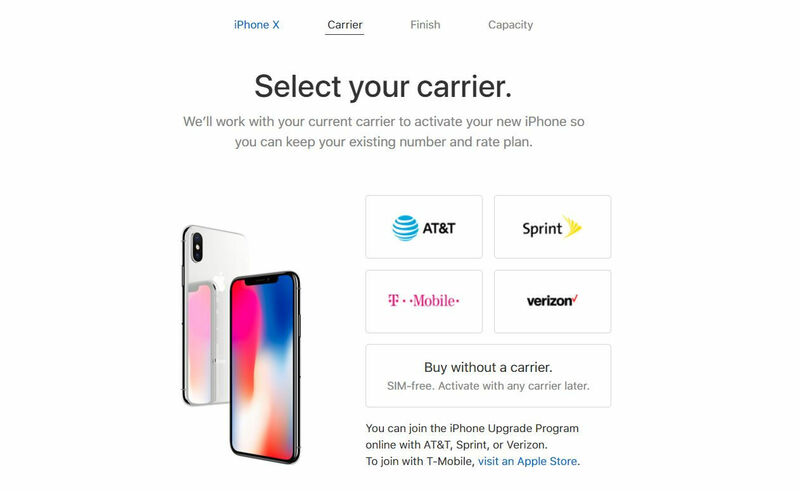 Yes, you can purchase it at the Apple Store and name a carrier, and know that even though its under “contract” it is unlocked because you paid full price at Apple, but it DOES have a contract. It actually did answer it if you pay attention. You can only order it via Verizon. false, Verizon requires a contract. Te funcionó? Busco el mismo para movistar colombia. The only solution for an unlocked iphone x is to purchase in store because pre-order requires a carrier contract. As mentioned, choose the Verizon or Sprint phone and pay in full. You will not be required to have a contract when you do this but good luck getting your hands on a phone! It works abroad and will be unlocked forever if you purchase it for full price at apple store or any other retail store without amorti payment plans through US carriers. I’m from india. And planning to buy iPhone X from US. I want iPhone X which is factory unlocked so it can work in India. Do I have to pay extra dollars for that? No dear, you will not ever pay extra at any Apple store when purchasing an unlocked iPhone. Please read the comment above as it is accurate and informative. You must walk into an Apple store and pay in full (no financing) for an unlocked iPhone choosing 1 of the 4 US Cellular carriers listed in comment above that would be most compatible with India. If they run out-don’t fret more will come!? I’m from India, Im looking to buy the iPhone X from the US. I want it to be unlocked so that i could use it in India with a GSM carrier. If i order the phone online selecting the ATT or T-Mobile carrier option. Will i have to activate the phone before using it in India? Or will it be sufficient if I just remove the sim that comes with the phone? Or will i have to walk into a store to be able to get it sim free? A friend of mine walked into the Apple store this morning in San Luis Obispo CA and tried buying an unlocked iPhone X.Only the T-Mobile version was available without having to have a carrier’s account information. So at least in SLO it is the same situation as trying to get an unlocked one online…you cannot get the A1865 without account information for Verizon or Sprint. Yeah the article is incorrect. You cannot get the A1865 model without providing an active Verizon account information. And further, if you did (I asked a relative who is on a Verizon contract to go through the process) the online Apple Store sticks you with an additional $30 upgrade fee and you can’t get around it. Many people successfully bought the iPhone X A1865 at full price without any contract. It might depend on the Apple Store you visit. Whatever I have gathered reading the posts is that a SIM free version is not yet available in Apple Store. But one can get a T-Mobile version paying full Amount, and that seems to be unlocked!!?? But will the warranty be valid in India? No. If something is wrong with the phone, you must have it serviced in the U.S.
That’s not true. I had no problem servicing a US iPhone in Singapore or Vietnam. Just check if Apple has an authorized service provider in your country. @Tuan Do : Did you try Iphone X with T-mobile or ATT carrier version with Vietnam simcard, does it work ? I have the same question. Because if warranty is no more valid hen there is no point whatsoever. I have TMobile account and my boyfriend is under ATT from a family plan she can’t modify. 1. He can’t get ATT info to sign up Apple upgrade program to add a iPhone x phone to the plan he is part of- so can I just get him TMobile appple upgrade program and insert the Att sim for him OR once Apple activates it on the spot at wore, then carrier will be locked with it (T-Mobile)????? is there a way I can buy TMobile and make one Work International that allows GSM?? Or it won’t work wants it activates with T-MOBILE?? Also, will a TMobile phone ( after activation) allow an ATT phone SIM card to work fine? Or the ATT has to be activated already from the beginning for it give work properly? Thank you so much and hope people can help me Please. Im from india should i need to unlock iphone x of any 4 carriers Or not needed to use in india ?? I went to Apple store and bought a iphone x with t-mobile, full price but it did not work on any SIM card other than t-mobile so I return it. What SIM cards did you try? They ALL work on GSM, meaning any model will work on Cricket (it uses AT&T’s GSM network anyway). However, the million dollar question is: even though it is unlocked and CAN be used on ANY network, that doesn’t mean there’s no ETF (early termination fees). With T-Mobile, that’s 200 $ you may have to pay if you want to leave them with more than 180 days left on the contract. And no, you didn’t technically sign a contract, BUT since you bought it under T-Mobile’s “umbrella”, I’m pretty sure they can charge you this fee. Bottom line, it’s still too risky for me and I’d recommend to wait until you can buy an UNLOCKED and CARRIER FREE iPhone X.
I am afraid that if you want an buy an Unlocked Contract-Free iphone X in US, it is not posible at the moment with any all the models. They are locked for the curries, therefore, you will need a contract with them, You may unlocked you iPhone X with your currier but it is nothing to do with Apple. My recommendation, wait until apple offer buy without a carrier SIM free. Activate with any carrier. This is not true, I am from the UK and purchased an unlocked iPhone X on AT&T yesterday from the apple store, I put my English sim in the phone and it worked straight away, no issues. Has anyone heard that iphone x onwards apple is providing international warranty on their phones ? Hi, I am from Bangladesh. Bought IPhone X online from Apple Store. Paid in full and Verizon carrier was selected at the time of Purchase. Is the Phone unlocked or do I need to unlock it in order to use it here? Zulfa, did u receive your iPhone X yet? I believe you might need to insert a USA based SIM card (atnt, t-mobile,sprint, Verizon) to activate your phone. I am from India. Is there a way I can buy iPhone X which is factory unlocked so that I can utilize the international warranty from APPLE. I believe there is no international warrant on carrier unlocked iPhones! I was at the Apple Store in Cherry Hill, NJ today and left only slightly less confused. The guy told me that if you bought a T-Mobile iPhone X it would only work on T-Mobile for the first 40 days and would then automatically unlock. He wouldn’t guarantee that if I bought a Verizon 1865 that it would immediately work with AT&T (my carrier). He said to call Verizon. He said there have definitely been activation problems with Sprint on other netwotks. Has anyone purchased a Verizon iPhone X at a physical Apple Store and activated it immediately on AT&T? This needs to be updated. You now have the option to choose “Activate Later” and it won’t even ask your carrier account info. Simply choose the model and color and size you want, choose the full price option then continue then you have two options here. You can choose either “Prepare for Carrier Activation” or “Activate with your Carrier later”. If you choose the first one, it will ask you to enter carrier info. If you choose the activate later one, it will just add to bag and no longer asks you. So essentially if you are buying a Verizon/Sprint model, you are buying a sim-free model. Great news, I’ve updated the post. I bought an Iphone X in a Verizon shop in LA and brought it to Denmark and it won’t work. How come? Anyone know why – it should be a sim free phone. Verizon stopped selling unlocked phones. You will need to wait a few months and contact Verizon to unlock your iPhone X.